Title: 'L'Amerique Septentrionale divisee en ses principaux etats'. 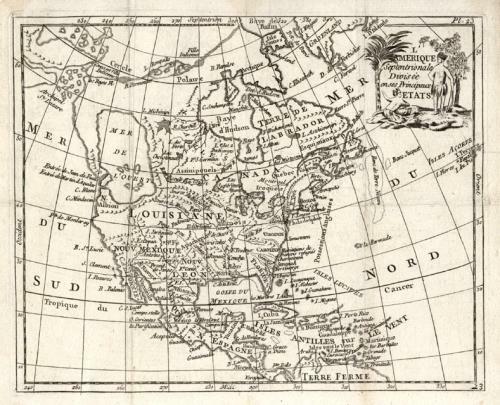 A map of North America showing the principal American States and the possesions of Spain and France. Of cartographic interest is the depiction of a speculative North-west passage and of a mythical inland sea (Mer de L'Ouest) below present day Alaska. This map was included in an uncommon miniature atlas measuring 10.5 cm by 6,5 cm (approx). In order to fit within the covers it was folded three times. Through successive unfolding and refolding the paper suffered slight damage at one or two of the intersections. A professional restorer (national library) has repaired the damage without loss. At the same time the image was de-acified, cleaned (but not bleached white) and pressed.